Gift baskets are fun to receive and make a nice change of pace when coming up with gift giving ideas. The thing I like most about gift baskets is they make a memorable gift for any occasion. The gifts can be themed and customized for each person and you can make it as frugal or lavish as you want. Pay attention to presentation, and even the most frugal items can come together to make an impressive gift. While I present some options for purchasing, keep in mind that many things can be made yourself at home with some DIY tutorials online. Who doesn’t love a gift basket? I can’t think of anyone I know that doesn’t. And you may have noticed gift baskets are really popular at school auctions and different fundraising events. People love them! If you haven’t put one together yourself then you should consider presentation. Basket first or gift first? Most gift baskets come in, well, baskets. But don’t limit yourself! 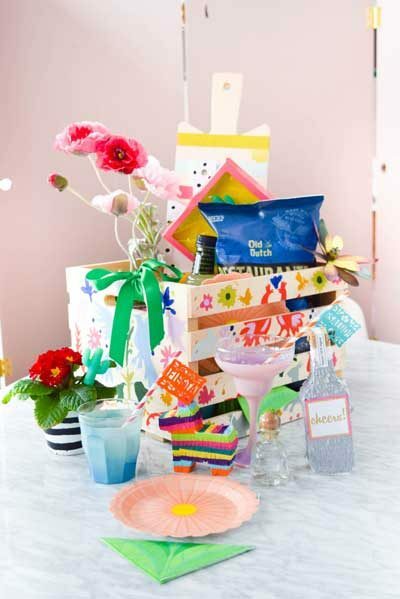 You can wrap a smaller box, use a crate, a bucket, metal paint can, colander, bowl, or a flower pot. Sure, you can go out and buy a new basket, but honestly, I’ve seen whole aisles of baskets at the thrift store and most are in great condition. Outside of reusing something you already have, that seems the most frugal option. For a dollar, you can get a basket and use as-is or even give it a quick coat of spray paint. Do you find enough gifts to fill a basket, or do you gather your gifts and then find a basket or container that will fit? It can go either way. If you start with a large basket, you’ll need to fill it with a lot of stuff or it will look sad and skimpy. A large basket won’t be the most budget-friendly option. If you start with a smaller container, there is less you need to fill it and make it look great. On the other hand, you might be improvising a bit and trying to see what you can get for $10 or $25. If that is the case, you might want to wait and see what will work best for your goodies and right-size the container. Me? 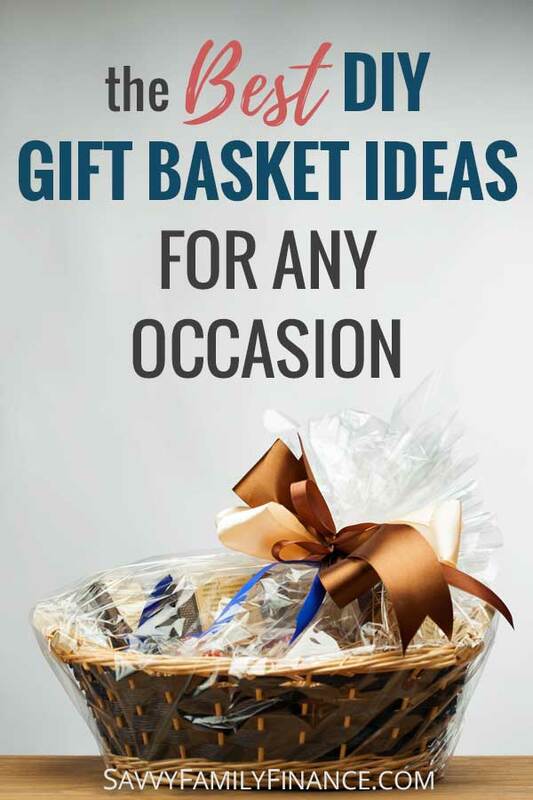 I prefer to get the gifts first and then figure out how large a basket will work best. It may turn out that one of the gifts works double-duty as the container. 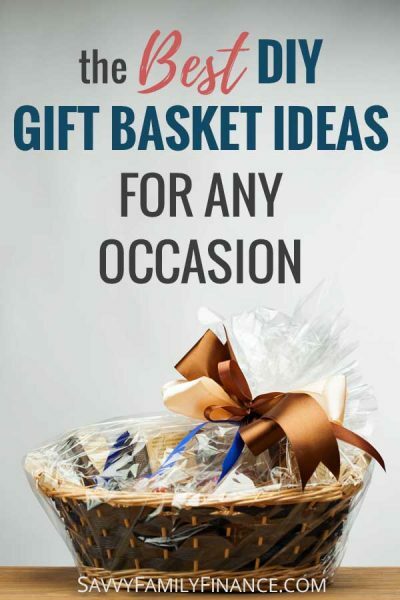 Now that you have an idea as to how you might package your gift, let’s look at ideas for what to include in your gift baskets. If you happen to have a Cricut at home, use it for items in your gift basket to bring it from “that’s nice” to “wow!”. 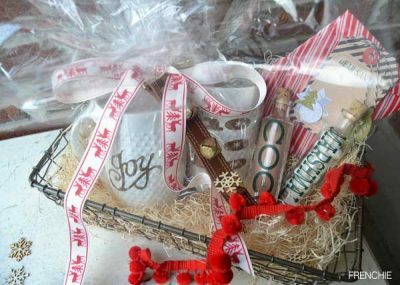 This holiday basket uses mugs, cocoa fixings and more to make a lovely Christmas gift. If you have a friend that likes to journal, or has talked about starting, then this is a great present. Journaling has lots of little stuff involved (or can) such as different colored pens, stickers, washi tape, and of course, a blank journal. Start a family tradition of watching Polar Express during the holidays. 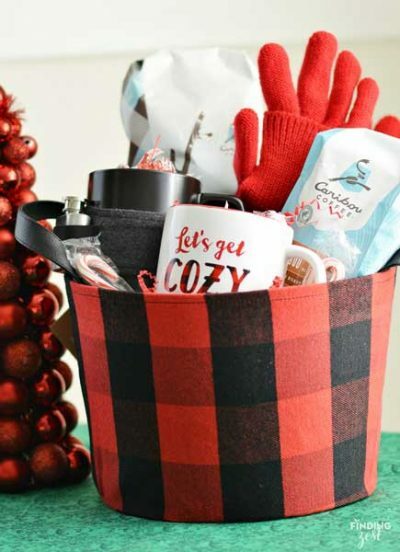 Give the kids an early present with this Polar Express gift basket. Read the book, and later make some cocoa to drink while you watch the movie. Have a teen on your list that likes to play online games? Trust me, teens are hard to buy for. But they will absolutely love a basket of things like earbuds or headphones with a mic, charging cables, a Steam gift card, and snacks. Know someone that is getting a new puppy? Puppies are so much fun. Some dishes, a toy, some puppy pads, and homemade treats will be welcome. Check out the recipe for pumpkin dog biscuits! We’ve all probably known someone with cancer. While we want to help, it’s hard to know what to do. Practical self-care gifts are welcome. 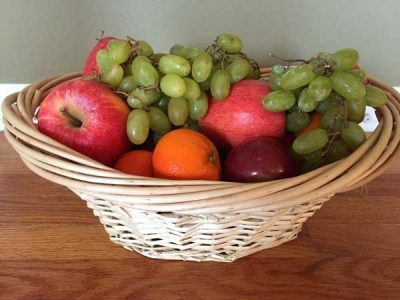 Whether you want to welcome a new neighbor or give a thank-you gift to someone, a fruit basket is a great frugal gift. Do you have a coffee lover on your list? It is easy to pull together some great coffee beans and related items (biscotti, anyone?) for a gift that will get used. 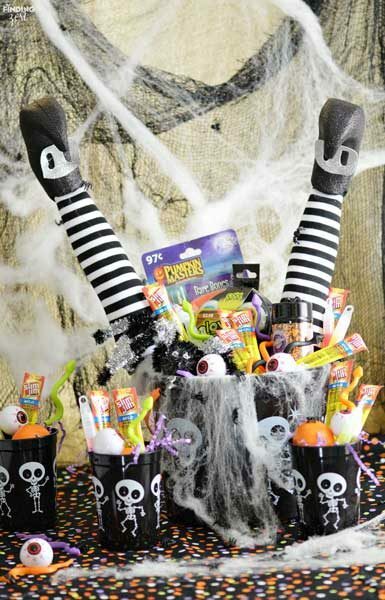 If you have a friend that LOVES Halloween then she will adore getting a gift basket to help celebrate. You can have a ton of fun with this and include treats, snacks, pumpkin carving items, face paint, fake spiders and eyeballs, and more! Preemies need special care and so do the parents. 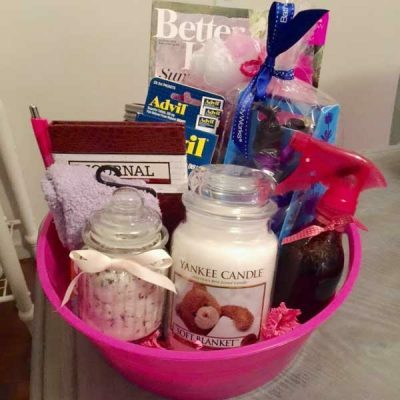 Show you care with a basket of items useful for preemie care and other items that will help the parents out as well. This fun box uses a crate to hold all the goodies. Pack it with items to make for a fun night. 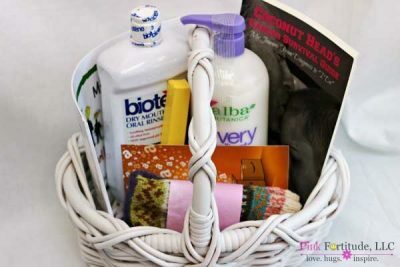 It’s fun to try out a new hobby and getting a starter-kit gift basket is the perfect way to check out a new craft. 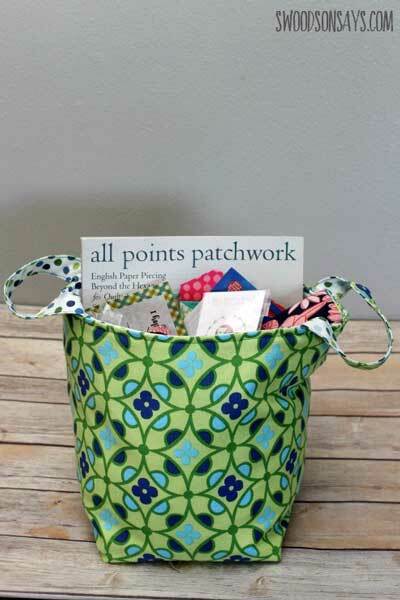 You could put together a beginner sewing or embroidery kit, a new knitter basket, or even a gift basket to start English paper piecing. 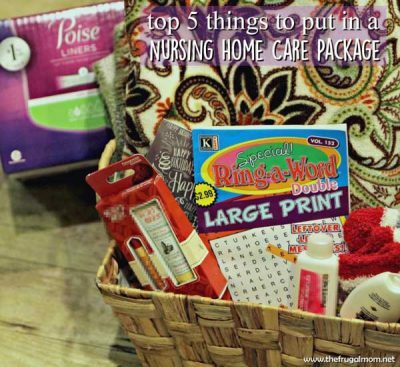 Nursing home residents don’t always get gifts or visitors during the holidays. By putting together some nice care packages, you’ll help bring a bit of joy to their day. 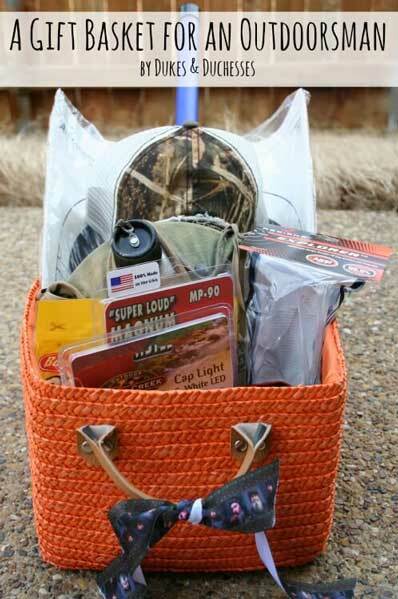 Does the outdoorsman on your list stump you as far as gift-giving goes? This gift basket of small and useful items will be appreciated. You can even throw in some hand warmers. Do you have a friend or coworker that is a new mom? A gift for her (not the baby!) will make her day. Help her care for herself. And maybe include some coffee! Such a fun gift! There are lots of options for the home gardener. Here you could put together some hand tools, seeds, sunscreen, plant labels, a kneeling pad, peat pots, and even a nail brush. Most of us like to pamper ourselves but often feel a bit guilty buying things to do so. This is why this makes such a great gift. It takes the guilt away and gives the recipient permission to indulge. 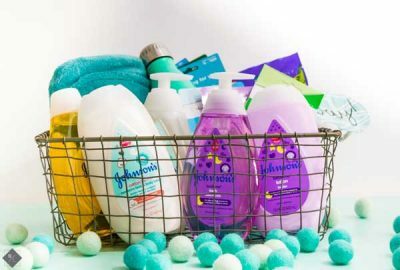 Items you want to be sure to include are polish, a bath bomb, body scrub, bath poufs, magazine, and a nail file. This is a totally fun idea for the summer. 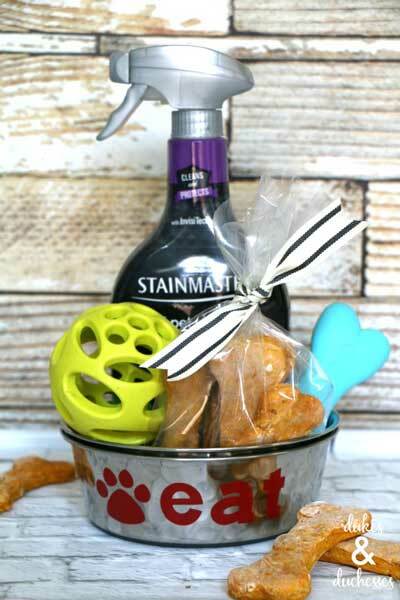 How about giving a sundae basket? Here you can include chocolate and caramel syrup, an ice cream scoop, sprinkles, cones, and a jar of maraschino cherries. How about breakfast in a basket? Here you can include pancake mix, syrup and a homemade fruit syrup, coffee, and a couple of dish towels or napkins to round out the gift. It’s fine to not “wrap” your gift basket, but sometimes you may want to give it a more polished look. For those instances, you can use cellophane bags. If you will be making a lot of baskets, then you may want to splurge on a large roll of cellophane. Cellophane is thicker and stiffer than your standard plastic wrap. To give the gifts in deeper baskets a bit more attention, you might want to add a bit of filler in the bottom. This both provides a bit of padding as well as raises the items up a bit so they are more visible. Without it, your gifts may look small and hidden. Here, if you have towels or linens as part of the gift, feel free to use those. You can also shred paper at home (think magazines, newspaper or old wrapping paper). If you prefer, you can even buy a small bag of decorative paper shreds from a dollar store or online. Hope you have fun putting together gift baskets! Do you have favorites?